Land Rover Discovery 1 Chassis shortened at the front and rear with most of the outriggers etc. cut off. Tornado Roll Over Protection System (cage) and body panels. The Engine has been moved backwards towards the center of the car by about 18"
This then feeds a high pressure Bosh Style pump. Finally the fuel pressure is controlled via a Sytec adjustable fuel pressure regulator. All the water pipes have been replaced with Silicone pipes Or alloy from Auto Silicone Hoses, (ASH) and the header tank is mounted on the rear bulkhead. The radiator is a standard Defender diesel unit. An 18" Electric fan fitted to the radiator, controlled using a X engineering thermostatic housing and switch. as part of the engine chage to4.6 we installed a craig davis EWP 150 coolant water pump. We have added a remote oil filter and oil cooler. Update Aug 2014, The oil cooler circuit has been modified to remove the need for a sandwich plate, Due to the lack of clearance between the axel (diff casing) and the sandwich plate on the front cover. 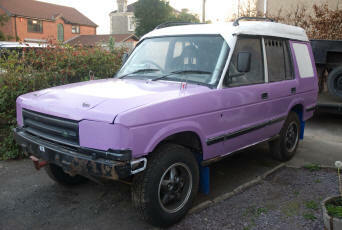 Gear box; Standard Land Rover R380 5 Speed Manual. A Rakeway prop shaft Center bearing (mounted in the front prop to reduce the excessive length due to the engine move. Bespoke rear prop shaft and center shaft on the front. Front, front prop shaft is a standard wide-angle prop. Front axel: Standard land Rover with "open" diffs. Update June 2014, the front radius arms changes for lighter (stronger) 3deg. caster corrected radius arms. Update 2015 The Dif pan has been replaced with Gwyn Lewis 4×4 heavy duty Dif pan. Rear axels: Standard land Rover. Update Feb 2014, the rear axel now fitted with Ashcroft Torque biasing diff. The rear radius arm are a Tornado special Getting rid of the std. LR Triangular bushes. The brakes are basic standard Range rover calipers and Britpart slotted solid disks. 2.5" remote fox's (with 12" of travel) all round (from Milners). Motor drive seats, Pro Seats (Navigators with extra head restraints). QT flat bottom Steering wheel. Full bodied, with the interior stripped, a full roll cage. Gear box; Standard Land Rover four speed automatic. 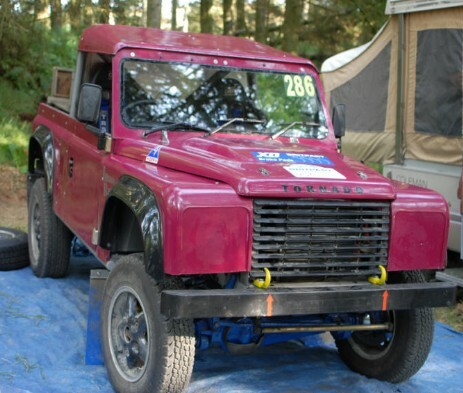 Front and rear axels: Standard land Rover with "open" diffs.